The average driver does not know what to do when the windows are damaged or broken on their automobile. Many drivers contact a local body shop or a tow truck in hopes of transporting the automobile to a facility for window repair. The faster and economical way is to call PG Sunland auto glass repair. Professional specialists arrive promptly to survey the damage and provide the right solution. Many times automobile window damage happens when there are no witnesses present to offer support or assistance. Sitting on the roadside in your vehicle is uncomfortable and can be unsafe. The mobile auto glass repair in Sunland provided by PG Auto Glass is designed to come quickly to you to take care of any problem that you have with your windows. A frequent problem occurs when your car or truck window cannot be repaired and needs to be replaced. This problem puts a big delay in your daily schedule that requires an immediate solution. PG Sunland auto glass repair experts use the right replacement glass for your installation and know how to avoid common installation errors that happen frequently with inexperienced technicians from unreliable companies. Your front, rear and side glass is not the only glass that is replaceable. You may have a sunroof that now leaks because of previous damage that was never repaired. Knowing what company to call for auto glass repair in Sunland will prevent you from delaying your needed window repairs and replacements on your automobile. Working with experts provides you with courteous and understanding professionals that have a long track record of satisfied customers. PG Auto Glass provides window replacement services for standard vehicles, commercial vehicles and recreational vehicles. All of these vehicles share the common problem of immobility when damage happens. There is only one way to do Sunland auto glass replacement correctly. 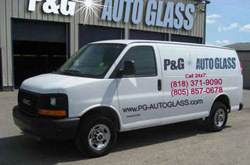 The PG mobile auto glass specialists arrive quickly to reduce delays and downtime. The professional service and quality work is affordable and is the most popular source for auto glass replacement in Sunland. Are you looking for reliable auto glass repair or replacement services in Sunland, CA in zip codes 91040 or 91041? Contact PG Auto Glass whenever you need any repair or replacement services.